Sportswear brand adidas Originals has launched its biggest sneaker drop for Spring Summer 2019 called the Nite Jogger. 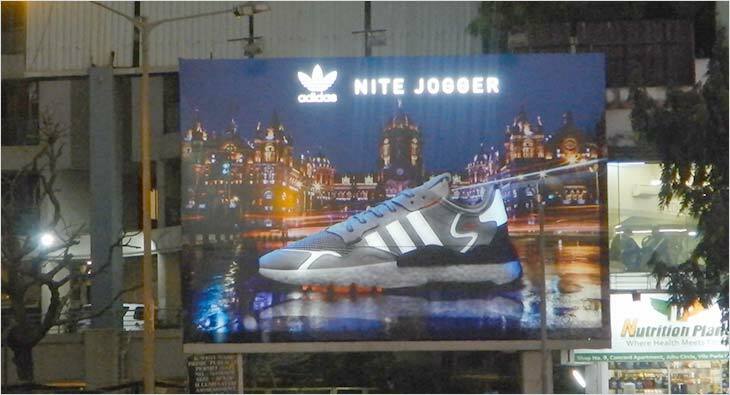 Inspired by the reflective technology of the Nite Jogger that illuminates its wearer after dark, adidas Originals has unveiled an innovative hoarding at JVPD Junction in Juhu, Mumbai, that brings out the story of the Nite Jogger against the bustling vibe of the city of Mumbai. The hoarding showcases the night time version of the Nite Jogger shoe against a beautiful backdrop of Mumbai’s iconic CST heritage building. Post 7pm, the entire hoarding lights up just like it would in reality with special detailed lighting on the iconic building and streets. This captures the #ItsNeverTooLate vibe and energy of the city that never sleeps. The Nite Jogger harnesses functional reflective technology to illuminate its wearer after dark. Enhancing its night time glow, the revolutionary silhouette is powered by deliberately placed hi-vis technology as reflective hits feature throughout the lacing, 3-stripes, heel patch, and highlight overlays. Keeping with this theme, the Nite Jogger shoe on the forefront of the hoarding creative too lights up on the reflective areas of the shoe highlighting the beauty of high vis 3M reflectors.